Custom Board Shorts. Design Your Own Board Shorts Online. Custom board shorts, can be designed using your illustrations, artwork or digital graphics. Made from splash proof Nautica material, design your own board shorts for a fast-drying, one-of-a-kind summertime look. Available in S to XL with a choice of black or white buttons and trim you can create these custom board shorts in a style to suit you. Custom board shorts, printed to order, are a great way to get your designs noticed in more places. Whether you are soaking up the sun by the side of the pool, or having some fun at the beach, design your own board shorts to truly stand out from the crowd. Available in S to XL, with a choice of either black or white buttons and stitching thread, take customization to the next level. Featuring a front zipped pocket, with Silk Sensation lining, and a rear pocket which fastens using two velcro pads, you have plenty of places to store your essentials with these custom board shorts. The 1.5 inch waistband widens to two inches at the front and is elasticated at the back. A double button and zip fastening at the front of the waistline ensures that your board shorts remain in place, perfect for when you're playing sports on the beach. Want to build your Fashion brand? 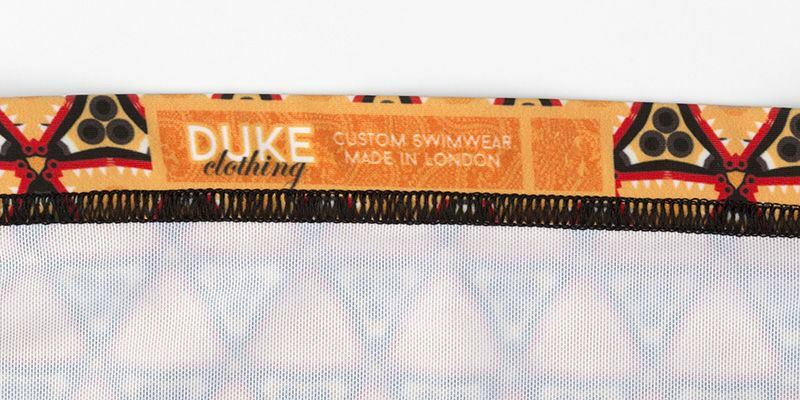 Then add your label to your custom custom board shorts, hand made at the same time as your garment, and have your brand name or logo added to the finished product. Custom board shorts, handmade, are a great way to turn some heads. Pair with custom sunglasses featuring the same design, and round this look off with a pair of custom flip flops for a 100% unique style, that oozes personality. You could even create a beach towel to complement your design, or a matching bikini, so that you and your partner can catch those rays together. Excellent shorts, runs a little large The print came out very well on the shorts. Much higher quality print than I was expecting, especially given the low-quality file I used. The length, rise, and inseam were perfect. 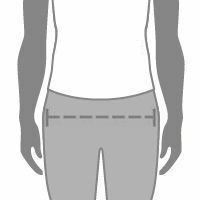 I'm 5'9", 31 waist and I prefer my shorts to have about a 4inch inseam, and an overall length of 15-17inches. I ordered the medium, expecting it to be a 32inch waist. However, the sizing was much, much larger. I wear a 31 in most other pants, but I could practically take these shorts on and off without using the buttons or zipper. My wife hemmed the waist so that they're tighter. Also, the stretch waistband crinkles a little awkwardly. It's almost like it stretched out. and it's also a little odd that the stretch band only circles half of the short. Other than that, I really like the shorts. Again, the length is exactly where I want them. I'll probably order more designs in the future, but I'll definitely go with a size small next time. How do I change the thread color? This is selected when you choose the button color. If you select the white buttons then your stitching thread will also be white, and when you select the black buttons your stitching thread will be black. Peached fabric has undergone a finishing process which stretches the fabric while drying. This is done once the weaving process has been finished. If you look at peached fabric really closely (under a microscope) it appears a little hairy. Are these board shorts waterproof? Custom board shorts, are splash proof, not waterproof. They are super-fast drying, with some water resistance, however would not stop you from getting wet if you went running into the sea. Browse a selection of custom board shorts that have been designed by Contrado Creatives.